Reversible Black and White Twin XL bedding will add versatility to your college decor! Looking for Contrarian - Black and White - Cotton Comforter in size Queen or King? You can't go wrong with adding a black and white Twin XL comforter to your dorm room! White and black college bedding makes it easy to match up the look of your dorm decor and your essential Twin XL bedding. And if you want to increase the stylish look of your black and white college comforter, just pick one of our unique designer dorm comforters for your extra long Twin bed! 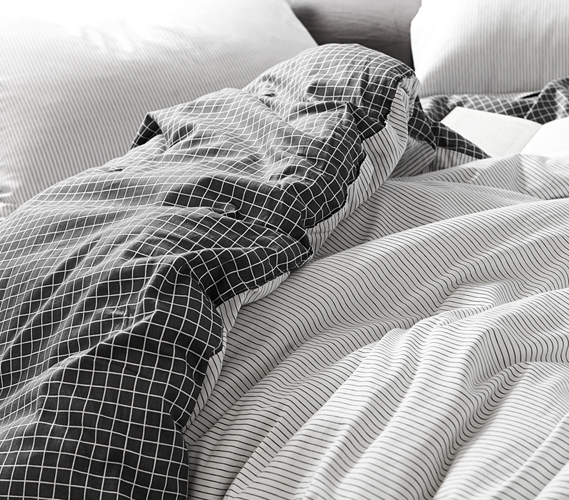 Our designer Contrarian - Black and White - Twin XL Comforter - 100% Cotton Bedding has a classic design that still has a place within your modern dorm room. With a striped pattern on the front side and a grid pattern on the back, this fashionable college comforter will add easy to match style to your dorm bed that isn't overly complicated. This designer Twin extra long comforter has a unique look that will have an impact on your dorm decor, but it is also made to be incredibly soft to upgrade the comfort of your cozy college bedding. 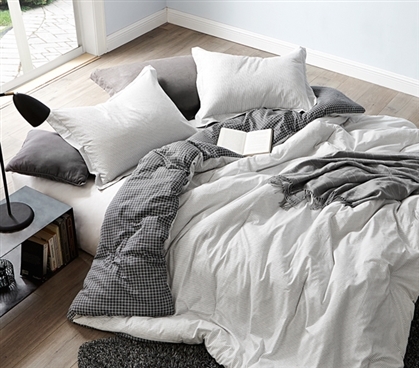 A comfy cotton exterior encases a thick inner filling that will give you the best in soft dorm bedding! This machine washable Twin XL bedding set also comes with a matching standard size sham, so your dorm bed can have a cohesive look and feel that will help blend your Twin XL bedding with your dorm decor and provide you with the most comfort possible. This cozy college comforter set is perfect for providing comfort and style to your dorm room throughout the semester.